Media Spinners: The researcher ignores statistical common sense. It is about time people realized that almost all research has flaws: the flag - flying / racism corollary has many innate errors partially built in. Understand dear reader that there are almost certainly fewer 'racists' among easy - going Aussies than most other nations. It is so typical of the man next door to leave you to practice your religion. Or whatever. We are so disrespectful of authority. We mock those who take themselves too seriously. All inimical to the racist moniker. For this researcher to set out to devine racism amongst us is asinine. Our worst sin seems to be sports fanaticism. There will be research soon to confirm the bias of Collingwood supporters! Here is the basic flaw. Understand that there will be racists amongst us. The researcher's ignorant analysis / defining work will pick them up together with the harmless flag wavers! I guess the silly survey will pick up arsonists as well: she should draw similarly non - astute conclusions from our racists who are also arsonists! Wake up to researchers who are willfully blind, merely asinine or hungry to justify the wasted research funds! DRIVERS who fly Australian flags on their cars to celebrate Australia Day are "more racist" than people who do not, according to research from UWA. University of Western Australia sociologist and anthropologist Professor Farida Fozdar and a team of assistants surveyed 513 people at the Australia Day fireworks on Perth's Swan River foreshore last year to find out whether there was a link between car flag flying and racist attitudes. Professor Fozdar said the team found that of the 102 people surveyed on the day who had attached flags to their cars for the national holiday, 43 per cent agreed with the statement that the now-abandoned “White Australia Policy” had “saved Australia from many problems experienced by other countries”. She said that only 25 per cent of people who did not fly Australia car flags agreed with the statement. Under the “White Australia Policy”, which was non-official government policy until after World War II, non-Europeans were barred from migrating to Australia. The survey also found that a total of 56 per cent of people with car flags feared for Australian culture and believed that the country’s most important values were in danger, compared with 34 per cent of non-flag flyers. Thirty-five per cent of flag flyers felt that people had to be born in Australia to be truly Australian, compared with 22 per cent of non-flag flyers. Twenty-three per cent of flag flyers believed that true Australians had to be Christian, while 18 per cent of non-flaggers agreed with the statement. An overwhelming 91 per cent of people with car flags agreed that people who move to Australia should adopt Australian values, compared with 76 per cent of non-flaggers. A total of 55 per cent of flaggers believed migrants should leave their old ways behind, compared with 30 per cent of non-flaggers. “What I found interesting is that many people didn't really have much to say about why they chose to fly car flags or not," Professor Fozdar said. 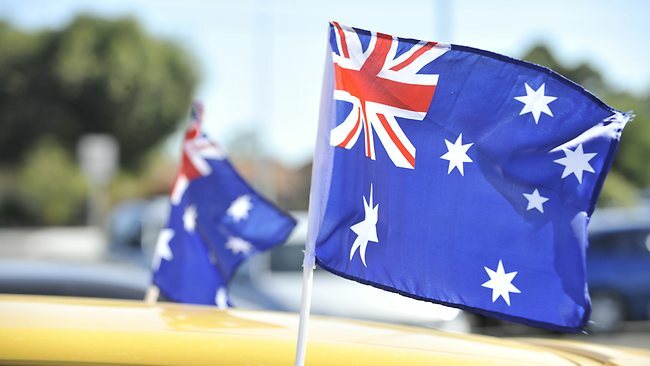 The research backs up an opinion piece from PhD student Michael Britton, who has lectured in history and politics at Curtin University and Notre Dame University, which argues that flying an Australian flag on a car may actually be a sign of disrespect for the country. How about you offer to study more area than just one, and then see what your results are? I guarantee if you were to do your silly study at a few locations in Sydney you would have a backward result. You cannot be serious!!!!!! So now we cannot be proud of our flag and our country without being labelled. Our tax dollars at work.